Soft fleece performance blended with a sweater-knit exterior, the women's Arcteryx Covert Hoody confers cold-weather comfort, alongside luxury sophistication that shines in a wide variety of situations. 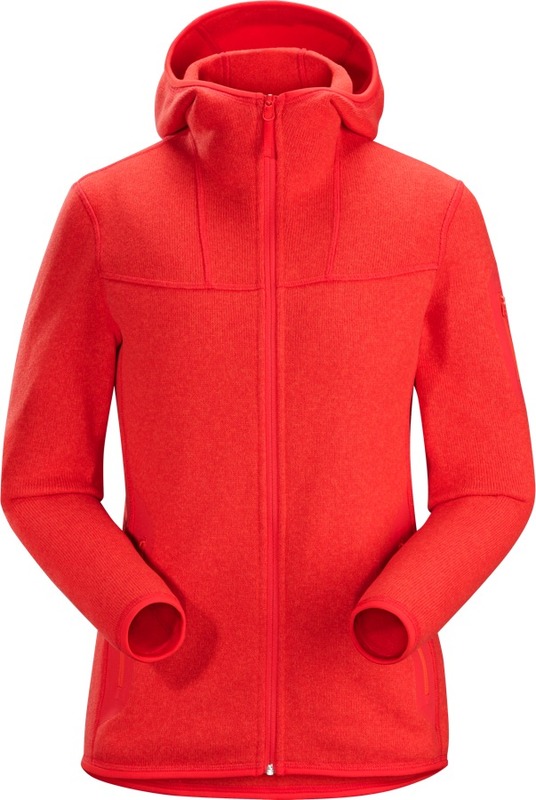 Clean styling and a neat fit combine to distinct success in the Arcteryx Covert Hoody. Soft fleece performance blended with a sweater-knit exterior, this Arcteryx women's hooded fleece confers all the cold-weather comfort and moisture-moving ability you'd expect, alongside luxury sophistication that shines in a wide variety of situations. The Arcteryx Covert Hoody is made from Alpenex™ heathered Fleece, engineered to offer the performance, warmth and quick-drying benefits of a technical fleece, with the look of a traditional wool knit. The Arcteryx Covert Hoody's soft and snug fleece interior contains body heat in thermal air pockets, while wicking moisture to outer layers, keeping you warm, cosy and comfortable. The knit-look exterior makes certain this Arcteryx jacket will be one you reach for on a daily basis. Complete with a neatly fitted fleece hood that happily sits underneath a waterproof jacket's hood for additional warmth and comfort in cold and/or windy weather. The Arcteryx Covert Hoody has laminated, zipped hand pockets and a distinctive zipped sleeve pocket, a durable binding on the hood, hem and cuffs, while its higher collar and neatly fitted, feminine design ensure this Arcteryx fleece layers underneath a ski jacket or waterproof with ease. Infused with Arc'teryx's commitment to highly functional design and outstanding craftmanship, the Arcteryx Covert Hoody is an elegant warmth-promoting solution for everyday mountain life. Technical attributes guarantee performance on snowy slopes and frosty chairlifts, while the Arcteryx Covert Hoody's knit-style appearance ensure you'll be most happy to wear this fleece at a smart lunch stop.